Fanart parodying the claims of the Gematsu leaks and the general reactions and debates surrounding them. This fanart was also used in the original post to the now-locked Gematsu thread on Smashboards. Shulk, Palutena, a Mii identical to Reggie Fils-Aimé's Mii, Pac-Man, Chrom, and the Chorus Kids are seen in the background. The Gematsu leaks were a series of major and seemingly credible leaks of Super Smash Bros. 4's playable roster reported by Sal Romano of the gaming site Gematsu after being given information from an anonymous tipster. Starting from the initial E3 2013 reveal trailer, they subsequently correctly predicted the coming newcomers without getting any definitively wrong, for over a year, before they were disproven. The leaks' seeming infallibility attracted considerable attention, being covered by news sites, and dominated Smash 4 roster discussion and speculation for the year they remained alive. However, while they identified many aspects of the games correctly, the leaks also had made multiple incorrect assumptions, such as predicting reveal dates wrong, predicting characters under general as opposed to specific names, and missing certain characters. This sparked considerable debate about the actual legitimacy of the leaks, though the leaker's previous track record kept the vast majority of observers believing them to be fully legitimate. Before E3 2013, Romano claimed to have received an email from an anonymous source claiming to know which newcomers would be introduced at E3 2013. Initially doubting the veracity of the letter, Romano jokingly posted the list to NeoGAF as a "unlikely prediction". Among the predicted newcomers were "Animal Crossing Guy" (turning out to be the Animal Crossing Villager); Capcom's Mega Man; the female trainer from Wii Fit; Little Mac from Punch-Out!! ; Nintendo's Mii; and Namco's Pac-Man. To the surprise of many observers, including Romano himself, the leak successfully predicted the reveal of the Villager, Mega Man, and the female Wii Fit Trainer; the lattermost was especially considered surprising, as the character was one that no one thought of, with Masahiro Sakurai himself even stating that the character was one that "no one expected". With the leak having gotten all three of the revealed newcomers correct, including the seemingly unlikely selection of the Wii Fit Trainer, many observers came to believe the leak had veracious information. Although Little Mac, Pac-Man, and Mii were not immediately revealed as the leaker claimed, some observers believed Sakurai decided to postpone their reveals for various speculated reasons, and that the characters would be revealed later on. Little Mac was later revealed as a playable character during the 13 February 2014 Nintendo Direct, but some observers found this prediction less surprising than the previous ones, due to the fact that Little Mac was a significantly speculated and requested character. During the Nintendo Direct on 18 December 2013, Rosalina was revealed as a playable character, but the character was not implicated in the leak. While this caused some suspicion of the leaker's legitimacy, a common theory was that the leaker only knew the E3 2013 plans, or simply knew some but not all of the games' newcomers, as the leak did not claim the characters listed were the only newcomers for the upcoming game. A few hours before the Smash 4-centered Nintendo Direct on 8 April 2014, the leaker reportedly sent another email to Romano; the contents of the email continued to claim that Pac-Man and a Mii would still be playable, as well as adding predictions for Shulk from Xenoblade Chronicles; Palutena from Kid Icarus: Uprising (tying in with another rumor); Chrom from Fire Emblem Awakening; the Chorus Kids from Rhythm Heaven (referred to by their Japanese name of Chorus Men in the leak); and an unknown Pokémon from Pokémon X and Y (referred to as "Pokemon from X/Y" in the leak). Toward the conclusion of the Nintendo Direct presentation, Greninja, who made its debut in Pokémon X and Y, was revealed as a playable character, along with Charizard. However, this prediction, while technically correct, came under much scrutiny, as a vague blanket prediction was much too general of a guess, and with the popularity of the games, and the prediction's distinction of being the only vague statement in the leak at the time, many observers believed that it was merely a logical deduction, failing to show actual inside information like the E3 2013 leak. Amid this, some observers speculated that these projects may have included potentially voicing Shulk in Super Smash Bros. 4, particularly in conjunction with the Gematsu leaks, though this speculation had yet to be confirmed. A day before E3 2014, Romano received another email from the leaker. The leaker continued to claim that Miis (under the name "Mii Fighters"), Pac-Man, Palutena (under the name "Goddess Palutena"), Chrom, Shulk, and the Chorus Kids would be playable; the leaker did not implicate any new characters, but said that there would be plans for post-launch character downloadable content, and that there was internal debate about keeping either Ness or Lucas, with the latter being "likely to get the cut". During the E3 Nintendo Digital Event of 2014, both Mii Fighter and Palutena were confirmed, with Pac-Man being confirmed later that day, confirming all characters claimed by the original leak, and leaving only Shulk, Chrom, and the Chorus Kids of the previous leaks left to be announced. While the Chorus Kids were not announced in any capacity, a Sneaky Spirit, an enemy from the Rhythm Heaven series, was spotted during a Smash Run demo during E3 2014. This made it the first and so far only representation of the Rhythm Heaven series in Smash. As noted by some fans of the series, all Smash Run enemies came from franchises represented with characters or stages, or else from Brawl's Subspace Emissary, suggesting the possibility of other Rhythm Heaven representation, and strengthening the prospect of the Chorus Kids. No other Rhythm Heaven representation had been revealed at the time. 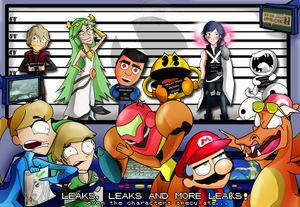 While the result of E3 2014 confirmed all the first leak's claimed playable characters, the veracity of the subsequent leaks remained unclear and was a subject of much debate. While the second leak accurately slated Palutena as playable, she was a character widely speculated to be playable, due to Sakurai having worked on Kid Icarus: Uprising and the presence of the, at the time, non-debunked "leaked" images that had been posted on multiple news sites. During E3, Sakurai confirmed that he decided on Greninja well before the release of Pokémon X and Y (which was six months before the second leak and the Smash Direct), and the character was created using concept drafts provided by Game Freak and The Pokémon Company. This cast further doubt on the leak's legitimacy; although "Pokémon from Pokémon X and Y" was technically correct, the leaker's inability to specifically state Greninja and only being able to do so with a vague blanket statement (and not being vague with any other character predictions) was scrutinized, and was seen by some as a "safe guess", rather than having actual inside knowledge. The leaker also just only brought up the Ness versus Lucas debate at E3 2014 with a non-definitive answer about it; observers noted that it would be unlikely that the final character roster would not be finalized well before this, as the final few months of game development are typically devoted to game balance, debugging, and other such tweaks. Sakurai also stated during E3 that the entire roster had been designed at the beginning of the games' development period. The leaker's proponents, however, argued that the statement could have been referring to earlier in development. However, Shulk was not revealed as expected and claimed by the leaker. Instead, the Fire Emblem characters Lucina and Robin were revealed as playable newcomers, along with the veteran fighter Captain Falcon. The reveal went against the leaker; not only was a prediction brought forth proven completely wrong, but neither character were implicated by the leaks, and Chrom himself, after being first implicated in the second leak and again implicated in the third leak, was revealed to have a role in Robin's Final Smash, disconfirming him as a playable character. With the leak being completely wrong in several respects, Romano contacted the leaker for an explanation; the leaker, however, ended up never responding. The reveal of two newcomers never implicated by the leak, the disconfirmation of Chrom, and the sudden silence of the leaker brought even more discussion on the leak's now-shattered credibility. Defenders of the leak argued that the leak, as commonly theorised, was outdated information obtained from the beginning of development, and that Chrom was intended to be included in the game, but was replaced with Robin and/or Lucina mid-development. However, in a Famitsu column after the reveal, Sakurai stated that, while he considered Chrom, he was always in favor of adding Robin instead, as he saw the former would just be another Fire Emblem swordsman having nothing unique to differentiate him from Marth and Ike, while the latter provided a plethora of unique moveset options and better represented Fire Emblem. Lucina was initially conceptualised as an alternative costume for Marth, and then, ironically, got upgraded to a separate playable character when Sakurai decided to change her attacks and physics to distinguish her from Marth. As such, it would seem Chrom was never actually planned to be playable, going against the claim that the leaker's information was outdated, and instead supports the notion that the leaker made up information and guesses in the subsequent leaks. With the continued silence of the leaker, the leak was later considered dead, and major discussion of it ceased. It remains ambiguous whether the leaker had legitimate information in the first leak, with the information in the subsequent leaks being severely outdated or outright invented, or if the leaker's claims had merely been lucky guesswork. The leaker's identity is also unknown, and it will likely never be known with their continued silence, though some have postulated that the leaker was merely an employee at E3 who happened to give Gematsu the information right before the event began. Shulk was later confirmed in a separate leak, called the ESRB leak, but much too late to repair the credibility of the Gematsu Leaks. In addition, the Chorus Kids are not playable and appear in the game only as a collectible trophy. However, a filename for a Rhythm Heaven icon was found in the game's data. Although Lucas was not on the initial roster of the game, he was later announced in a Nintendo Direct on 1 April 2015 to be DLC for the game. In addition, in the same Direct, it was announced that SSB4 would receive a schedule of DLC (which ended on February 3rd, 2016), including not only Mii Fighter costumes, but additional characters. What all of this means in regards to the assertions of the Gematsu leaks, however, is uncertain. Chrom Planned Sakurai stated that though Chrom was originally planned, he was cut in favor of Robin due to being too similar to Ike and Marth. Chrom would later be playable in Super Smash Bros. Ultimate. This page was last edited on September 21, 2018, at 13:35.